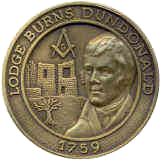 A Site belonging to a Lodge with "Burns" Dundonald No.1759 as its name and number, would not be complete without a page dedicated to him, we therefore dedicate this section to his memory. 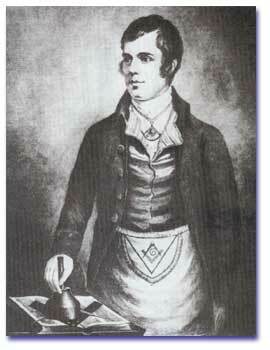 Freemasonry has no greater name than Robert Burns. If there are those who question his investiture as Poet Laureate of the Canongate Kilwinning Lodge, owing to the absence of certain documentary evidence, no one denies that he was, and is, the greatest poet of Freemasonry, the singer alike of its faith and its friendship, its philosophy and its fun, its passion and its prophecy. Nay, more; he was the Laureate, of the hopes and dreams of the lowly of every land. Higher tribute there is none for any man than to say, justly, that the world is gentler and more joyous for his having lived; and that may be truly said of Robert Burns, whose very name is an emblem of pity, joy, and the magnetism of Brotherly Love. It is therefore that men love Burns, as much for his weakness as for his strength, and all the more because he was such an un-veneered human being. It is given to but few men thus to live in the hearts of their fellows and today, from Ayr to Sidney, from Chicago to Calcutta, the memory of Burns is not only a fragrance, but a living force uniting men of many lands into a fellowship of Liberty Justice and Charity. "The Memory of Burns!" cried Emerson, "I am afraid Heaven and earth have taken too good care of it to leave anything to say. The west winds are murmuring it. Open the windows behind you and hearken to the incoming tide, what the waves say of it. The doves perching on the eaves of a stone chapel opposite may know something about it. The Memory of Burns - every man's, every boy's, every girl's head carries snatches of his songs, and they say them by heart; and what is strangest of all, never learned them from a book, but from mouth to mouth. They are the property and the solace of mankind!" Your thrifty old mother has scarce such another, To sit in that honoured station. A prayer from the muse, you may well excuse, Tis seldom her favorite passion. May secrecy round be the mystical bound, And Brotherly Love be the center." "Robert Burns, Poet, from Mauchline, a member of St. James, Tarbolton, was made an Honorary Member of this Lodge." This was the first Lodge to distinguish Burns with the designation "Poet," and to honour him with honorary membership. Burns is described at this time as nearly five feet ten inches in height, and of a form agile as well as strong; his high forehead shaded with black, curling hair, his eyes large, dark, full of bright intelligence, his face vividly expressive. His careless dress and untaught manners gave an impression of coarseness at first, but this was forgotten in the charm of his personality, and his face in repose had a calm thoughtfulness akin to melancholy. Full of fun and fire, affable and the best of good company, his superior mind did not make him supercilious, and he loved more than all else, a festival that was half frolic and a feast where joy and good will were guests. Alas, drinking was a habit in the Scotland of those days, to a degree we can hardly imagine, as much in the Church as in the Lodge; and it made the bitter tragedy of Robert Burns. Truth obliges us to admit that his moral failure was early and pitiful, due alike to his environment and to a fatal frailty of which made him fitful, unstable, and a prey to every whim of fancy and of passion. It is an awful risk to be endowed with the genius of a Burns; it digs deep pitfalls for the man to whom it is given. Yet, if in his later years he was a degraded man of genius, he was never a man of degraded genius. The poison did not enter his song. Allan Cunningham was right when he said: "Few men had so much of the Poet in them, and few poets so much of the man; the man was probably less pure than he ought to have been, but the poet was pure and bright to the end." But know not what's resisted." By the same token, no great poet whose name is linked with our Craft ever owed more to Freemasonry, or gave more to it. More intimately than any other he was identified with its life, its genius and its ideals. Its teachings moved his thought; its spirit inspired his song; its genius nurtured that love of freedom and Fraternity which he set to everlasting music. So much is this true, that it remains a marvel to this day how Shairp could have written a biography of Burns without once mentioning his membership in the Craft. In the gentle air of Freemasonry he found refuge from hardship and heaviness of spirit; and its fellowship served to shelter him from the poisoned arrows of petty bigots who were unworthy to untie his shoes - men of a kind known in every age, whose hard-heartedness was clad in unctuous hypocrisy. Surely, if ever of any one, it can be said of Robert Burns, that his soul goes marching on. He was the harbinger of the nineteenth century, the poet of the rights and reign of the common people, whom, it has been said, God must love because he made so many of them. The earth was fresh upon the tomb of George Washington when that century was born; it discovered Lincoln and buried him with infinite regret. But its triumphant melody first found voice in the songs of Robert Burns, as the greek singer inspired Patriarch with the fire which kindled the Revival of Learning, and out of the inertia of the Middle Ages created modern times. So when Taine, the French critic, came to account for that age he found that it's spirit "Broke First in the Scotch Peasant, Robert Burns." - a man of all men most fitted to give it voice, because "scarcely ever was seen together more of misery and of talent." There are those who dream of a vague blur of cosmopolitism, in which all local loyalties, all heroic national genius shall be merged and forgotten. Not so Robert Burns. He was distinctively a national poet, striking deep roots in his native soil, and, for that reason, touching a chord so haunting that it echoes forever. This at least is true; a man who is not deeply rooted somewhere - to whom one spot on earth is not a little dearer, and the sky over it a little bluer - will not be of much use anywhere. When Burns appeared the spirit of Scotland was a low ebb. Her people were crushed and her ancient fire almost quenched. Her scholars blushed if they used her dialect. It was at such a time that a God-Endowed singer took up his harp, inspired by the history of his people, the traditions of Wallace and Bruce stirring him like a passion, his soul attuned to the old ballads of love and daring, singing the simple life of his nation in its vivid and picturesque language. He struck with a delicate but strong hand the deep and noble feelings of his countrymen, and somewhere upon his variegated robe of song will be found embroidered the life, the faith, the genius of his people. No wonder the men loved a poet, and make his home at once a throne of melody and a shrine of national glory. Because he was so deeply rooted in the soil of his own land; because he was so sweetly, sadly, joyously - yea, and even sinfully - human, his spirit and appeal are universal, for the human heart beats everywhere the same, and by loyalty to the genius of our own country we best serve our race. His passion for liberty, his affirmation of the nobility of man, his sense if dignity of labour, his pictures of the pathos and the hard lot of the lowly, find response in every breast where beats the heart of a man. It is thus that all men love Burns, for it was he who taught, as few have taught since the Son of Man lodged with the fishermen by the sea, the brotherhood of man and the kinship of all breathing things. Such singers live as long as men love life, and their words become a part of the sacred scriptures of the human heart. This is no time to deal in literary criticism - a dreary business at best, a dismal business at worst. It is by all agreed that Robert Burns was a lyric poet of the first order, if not the greatest song writer of the world. Draw a line from Shakespeare to Browning, and he is one of the few minds tall enough to touch it. The qualities of Burns are simplicity, naturalness, vividness, fire, sweet-toned pathos, and rollicking humour - qualities rare enough, and still more rarely blended. His fame rests upon verses written swiftly, as men write letters, and upon songs as spontaneous, as artless, as lovely as the songs of birds. He sang of simple things, of the joys and woes and pieties of the common life, where sin be shadows virtue and the cup of death is pressed to the lips of love. He saw the world as God made it, woven of good and ill, of light and shadow, and his songs come home to rich and poor alike, a comfort and a consecration. No wonder Burns was the best beloved poet of Lincoln, as much for his democracy as for his humour, his pathos, and his rich humanity. With him social rank was but a guinea stamp, a bit of tawdry tinsel alongside the native nobility of manhood. He honoured a man for his worth, not for his wealth. For the snob, for the fop, he had genuine contempt. If he flayed the selfish pride of the rich, it was not from envy - just as truly did he scorn the poor man who, instead of standing erect, only cringes and whines. He told the poor man that it is no sin to be poor, but that it is a sin to be ashamed of it. He taught that honest poverty is not only nobler, but happier, than indolent or ill-gotten wealth. The Cotter's dog and the Laird's dog are very real dogs, as all admit, but their talk is something more than dog-philosophy. It is the old, old story of the high and the low, and it is like Burns to take the part of the under dog. Still, had the Cotter's dog given way to self-pity, Burns would have been the first to kick him. He hated fawning, as he hated sham, and he knew that if toil is tragedy, labor is an honour and joy. 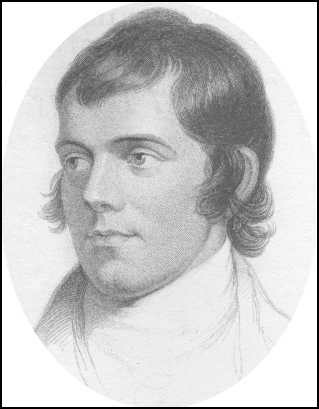 That which lives in Robert Burns, and will live while human nature is the same, is his love of justice, of honesty, of reality, his touch of pathos and melting sympathy, his demand for liberty, his faith in man and God - all uttered with simple speech and the golden voice of song. His poems were little jets of love and liberty and pity finding their way out through the fissures in the granite-like theology of his day. They came fresh from the heart of a man whom the death of a little bird set dreaming of the meaning of the world wherein life is woven of beauty, mystery and sorrow. A flower crushed in the budding, a field mouse turned out of his home by a plowshare, a wounded hare limping along the road to dusty death, or the memory of a tiny bird who sang for him in the days agone, touched him to tears, and made him feel the old hurt and heartache of the world. The poems of Burns did not grow; they awoke complete. He was a child of the open air, and about all his songs there is an outdoor feeling - never a smell of the lamp. He saw nature with the swift glances of a child - saw beauty in the fold of clouds, in the slant of trees, in the lilt and glint of flowing waters, in the immortal game of hide-and-seek played by sunbeams and shadows, in the mists trailing over the hills. The sigh of the wind in the forest filled him with a kind of wild, sad joy, and the tender face of a mountain daisy was like the thought of one much loved and long dead. The throb of his heart was warm in his words, and it was a heart in which he carried an alabaster box of pity. He had a sad life and soul of fire, the instincts of an angel in the midst of hard poverty; yet he lived with dash and daring, sometimes with folly, and, we must add, - else we do not know Burns - with a certain bubbling joyousness, despite his tragedy. Such was the spirit of Robert Burns, a man passionate and piteous, compact of light and flame and loveliness, capable of withering scorn of wrong, quickly shifting from the ludicrous to the horrible in his fancy, poised between laughter and tears - and if by some art se could send his soul into all the dark places of the world, pity and joy would return to the common ways of man. His feet may have been in the furrow, but the nobility of manhood was in his heart, on his lips the voice of eternal melody, and in his face the light of the morning star. Long live the spirit of Robert Burns, Poet and Freemason! May it grow and glow to the confounding of all injustice, all unkindness! "He haunts his native land As an immortal youth; his hand Guides every plow. Gie me the masters apron! Gin he but wears the apron! Arise your friendly ranks alang . That is worn by the master mason! 'Tis seldom her favourite passion. And brotherly love be the centre. Dear Brothers of the Mystic Tye! Companions of my social joy! I'll mind you still, tho' far awa'. Which none but Craftsmen ever saw! Those happy scenes, when far awa'. Shall be my pray'r when far awa.